Product #21860 | SKU NE8FDP | 0.0 (no ratings yet) Thanks for your rating! 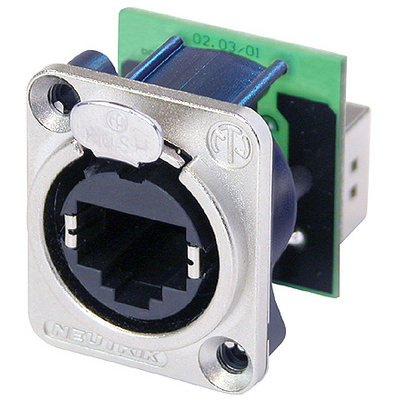 The NE8FDP from Neutrik , part of the EtherCon series, is a high-quality RJ45 feedthrough receptacle shaped to fit into standard panels used in the entertainment industry. The D-shape metal flange with latch lock ensures your cable has a snug fit with the connector. The rugged construction makes this connector ideal for panel mounting or installations.